Last night was my craft night with the london sewing and craft group from Meetup. I’ve been going since about september last year. As I’ve more or less been self taught, my crafting has been a pretty solitary pursuit. So its really nice to meet up and see what other people are doing and also to show off my projects. 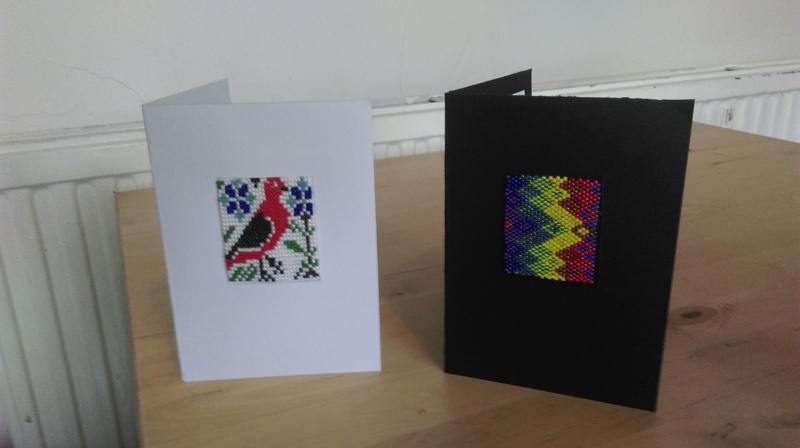 My beadweaving is still pretty unusual among the people who go and despite them all being sewers and knitters (cross-stichers and crotcheters) they are always astounded at how much patience beadweaving appears to take. For me it is much easier to be patient and meticulous while beading than while sewing. 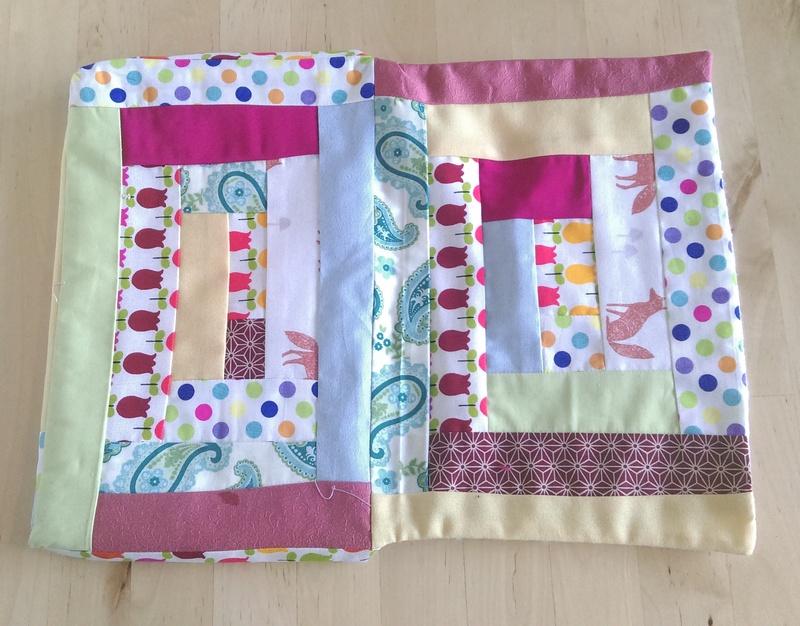 But actually this is a post about sewing because last night I finally finished my second patchwork laptop case. I had done the majority over the weekend but there was a little hand sewing left. I started both cases at easter, a small one for my personal tablet and a larger one for my work laptop. The smaller one was a bit more complicated. I’d seen a link on buzzfeed to ispydiy and an envelope laptop case. Their version is simply glued together, but I decided I wanted a lined and sewed laptop case. So I followed the outline and general shape. I’d learnt about log cabin patchwork at my quilting course and it was definitely my favourite technique of the day. I made three log cabin quilts and them joined them with some triangular pieces to get the outline I needed. I then joined it with the lining and hand sewed the triangles to the inside flap to seal it. The fabric choices for this one started with some fat quarters I bought in a shop in Bath. The tulip fabric is my favourite and was my starting place. 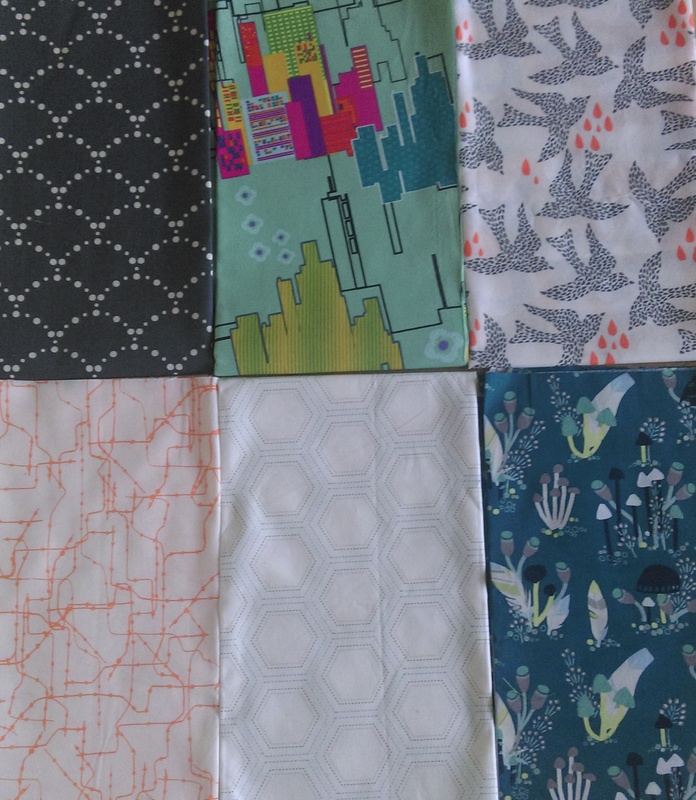 I also had the flox afbric and the red star fabric. I bought the dotted fabric and paisley pattern along with the plain green. The others came from my stash of fabrics apart from the yellow which came from my mothers stash. I was trying to keep it quite fun and interesting but also to match the colours of the tulips with the red star fabric. This was pretty hard but I like the way it looks. For the second case I simply made a large log cabin rectangle. Which I joined at the edges to make a case and added a lining and zip. This one is slightly more sedate colour wise. I started with the owl (again from bath) and the chinese print. Both had a cream background so I chose other prints with either cream bases or blue/black tones. The odd flashes of red/pink and the bright green/blue of the paisley really stand out. I’d had some high expectations for this post, I’d had a brilliant idea for something I wanted to make and a one and a half days to make it. I did actually finish it, and finished all the machine work on my second laptop case. But today after finishing sewing and tidying up, I was intending to go out. Instead I’ve ended up back on the sofa, where it’s safe. I wasn’t exactly that excited about my plans but it didn’t warrant me crying as I locked the door. I made it to the end of the road, before heading home again. I know my therapist would say that I have to learn to accept and acknowledge the part of me that isn’t comfortable socialising with strangers but its still a blow to feel that incapable. So I’m going to leave the post about my exciting project until I can feel excited about it. 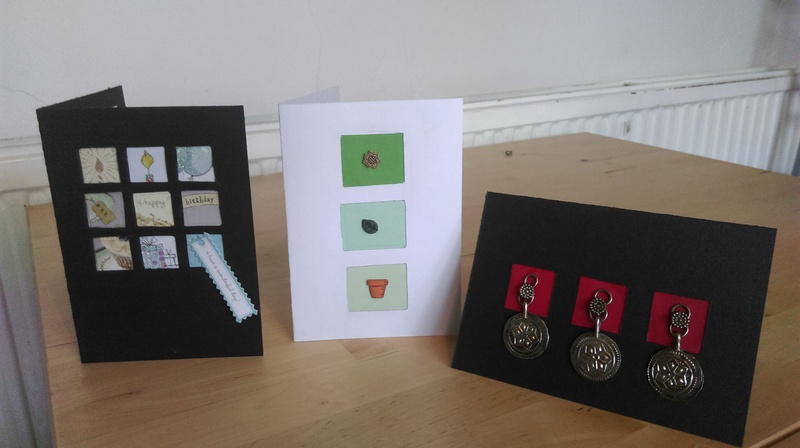 Instead a few pictures of some cards I made, June is one of the birthday months in my family, so I was just doing some prep and making the most of my flatmates being out to use up all the space in the living room. 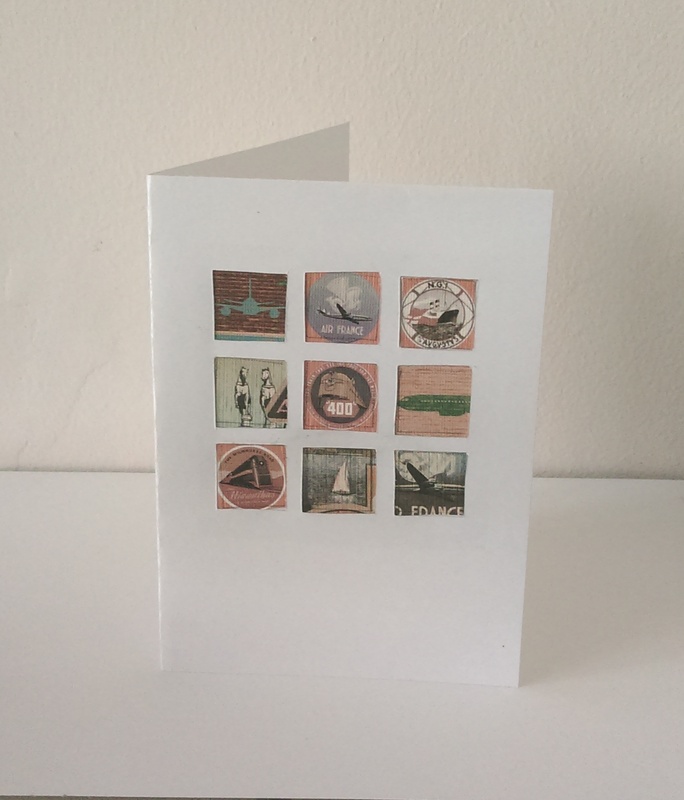 The cut out squares is a technique I use a lot for cards, its simple enough to do and looks effective. 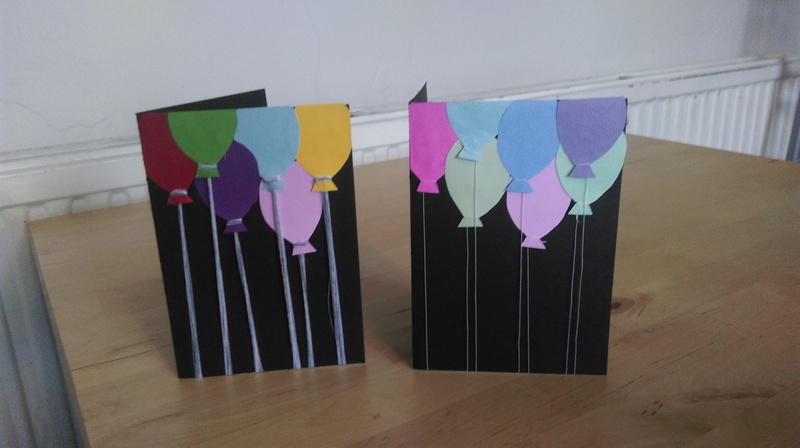 The ballons was an idea I got off google images and again simple but looks good. The other two are squares of off-loom bead weaving, that I found in the box of stuff. I cut a square out of the card so that they sit out slightly but it looks more professional than just gluing it on the front. For my birthday I got a one-day quilting and patchwork course from my parents. After much searching, I settled on the one from cheekyhandmades. So in March, I had a very fun full day of learning how to choose fabric, how to cut different shapes, what equipment is vital and which is just useful (I actually should have written more stuff down), how to join the pieces, log cabin quilting and how to quilt them both with straight lines and free motion embroidery, and how to bind the edges. There were only three of us that day, so it was a very personalised and relaxed experience. The only negative was all the cats. I knew I was slightly allergic but as my dad is very allergic I’d never actually spent that much time around them, and by the end of the day I really couldn’t breathe. I have however been recommending her (Jen – I think) to all of my sewing friends. 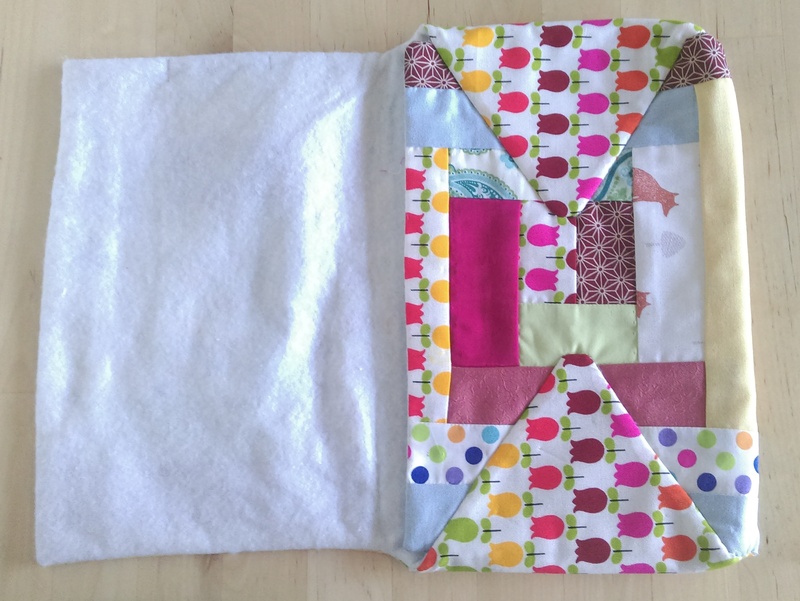 During the day, I made two complete small quilted pieces, about the size of a tablemat. 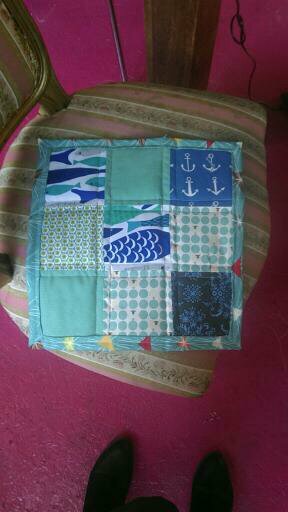 The first one was 9 squares, I chose about 5 aqua/blue fabrics with a slight nautical theme. 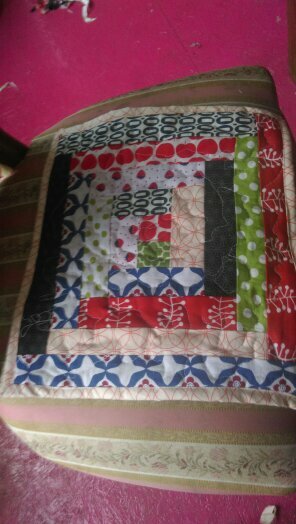 This one was quilted with straight lines around the squares. 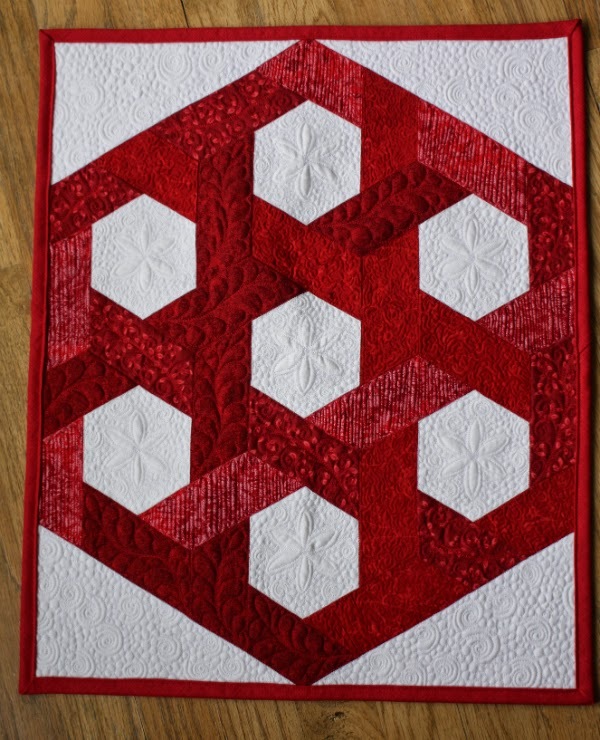 The second one was a log cabin quilt, with free motion quilting. I’d seen the strawberry fabric, but I couldn’t find a way to work it with the fish fabric. I decided to go for other simple geometric prints in a primary colour scheme. 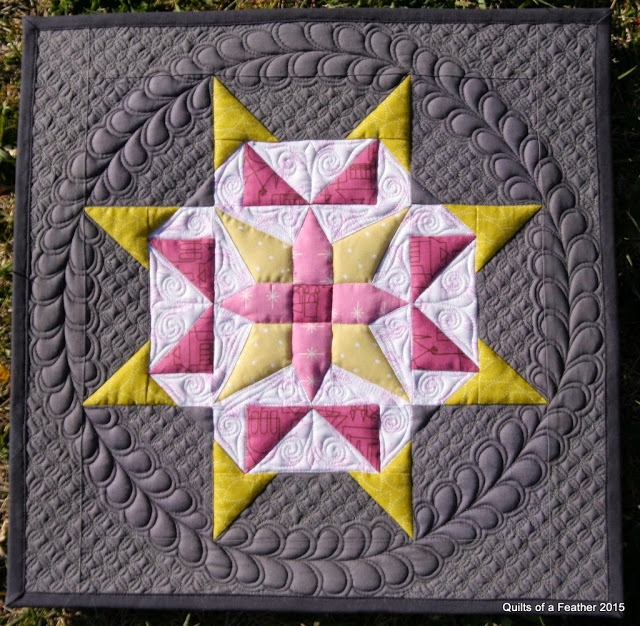 I’m really bad at the free motion sewing but after seeing a pair of quilts on my blog crawl during this mornings commute (I ended up at Quilts of a Feather and then Devoted Quilter) , it just got moved to the top of my list of things to learn. It might be a steep learning curve but look how incredible it could be. 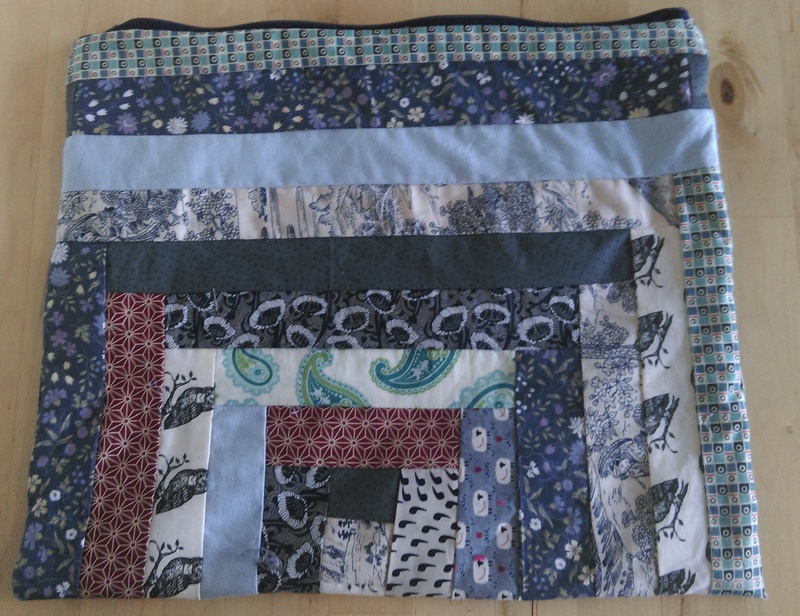 Since the quilting course, I used my new found patchwork skills to make one and a half laptop cases, I’ll write a post about that soon, promise. Anyway, another birthday present I received was an etsy giftcard from my aunt. I spent it last weekend on some fat quarters and a beading pattern that I’ll talk about some other time. The fat quarters were from a shop, the modern maker. I selected my own bundle. 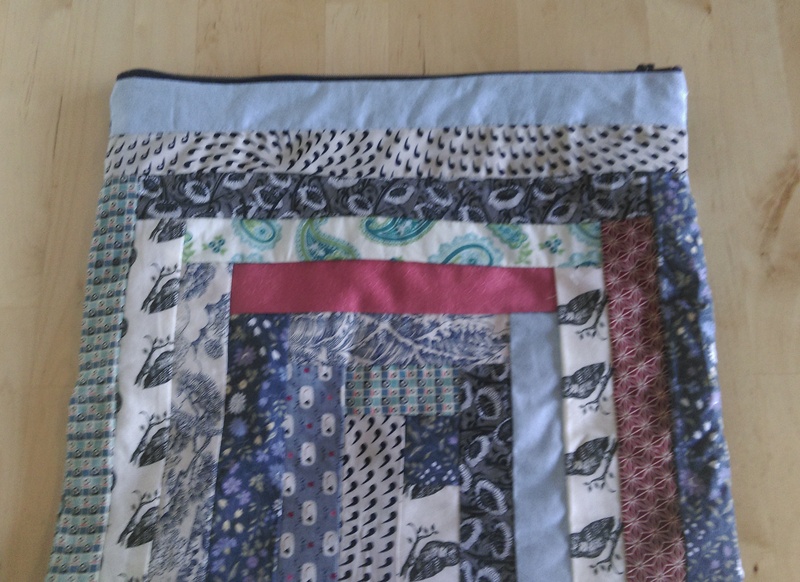 I first chose the blue fabric with mushrooms and feathers, then promptly saw the building pattern and the birds. Then it was a case of trying to find things that went with all three. I’m happy with the selection, all I need to do now is find a pattern that does them justice. I know it’s May and even here in England it’s not mitten weather but I was inspired by my last post to actually finish these handwarmers, despite having forgotten about them while writing the WIP list. 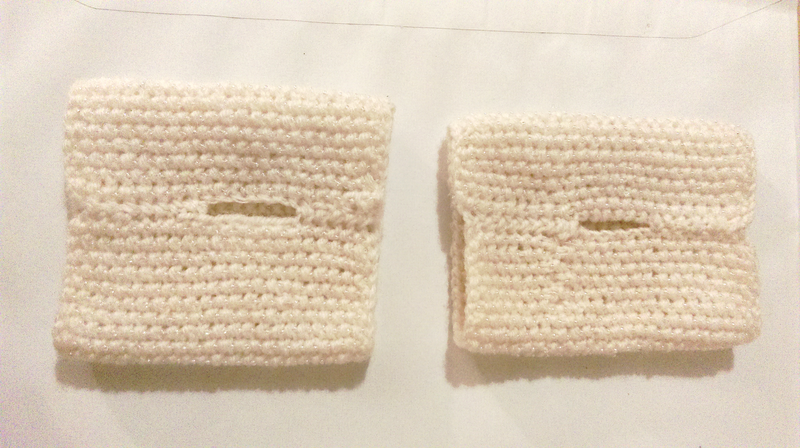 These handwarmers were incredibly easy to make; they are just a single square which I joined at the seams and left a hole for my thumbs. The original pattern used circular knitting to create thumbtubes. However I a) have never done any circular knitting and b) lost the original pattern when my old laptop died. So for now I shall have cold thumbs. Perhaps one day I will add thumbtubes on. I chose the original pattern because it was incredibly simple and would let me just knit in a square and I was keen to practice moss stitch. Keen observers will notice one is a bit bigger than the other. I am a very tight knitter, I often cast on to tight to knit the next row and have been trying to improve this. Because the project was very stop start, I must have got into the habit of knitting with better tension control. 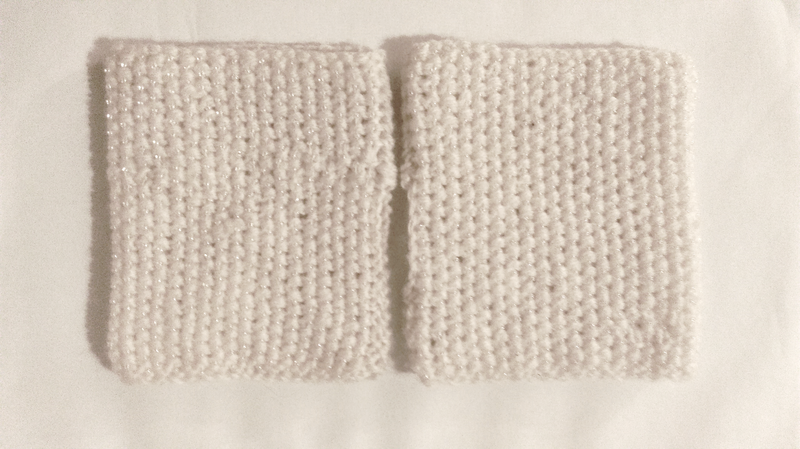 And the bigger one is the square I knitted second. Next time I will try and measure it as I go along. Having them different sizes is only mildly obvious when I’m wearing them but it does feel a bit odd. Unfortunately I couldn’t figure out a way to take a picture of both hands wearing mittens at the same time. Once I had made the final mittens I embellished them. Hence the title of this blogpost although all credit goes to my sister as that was her response to the picture I sent round. To embellish them I have sewn seed beads into the crevices of the moss stitch. This was done with a running stitch on a single strand of thread. I tried to remember to tether the thread every 4 rows so that if it snaps I don’t lose all the beads. I really love the look of beaded knitting. The first thing I ever knitted (a phone case), I promptly embroidered beads onto, although slightly fewer than this time. I now have so many ideas for a knitted and embellished scarf (actually scarves but lets be realistic here). Anyway for now, I shall wait for it to get cold again so I can wear my sparkly mittens. I was thinking that it would be good practice to have some kind of regular post, and I think once a week may end up being a bit optimistic so I’ll settle on once a month for the time being. My new’s year resolution was to only have one project of each craft on the go at once. I think so far I’ve managed to stick to this. I was trying to keep on top of all my different projects and actually finish more projects. Beginning a project is always my favourite part. So I thought I’d do a list of stuff I’ve started (works in progress or as my boyfriend likes to call it: mess) and hopefully next time I can update it. The blanket. This one will be on the list for a while I think. A peyote necklace I promised my sister about a year ago. A patchwork case for my work laptop. That’s not too bad actually. I thought that there would be more. I’ve definitely got more in my head but that’s another post altogether.